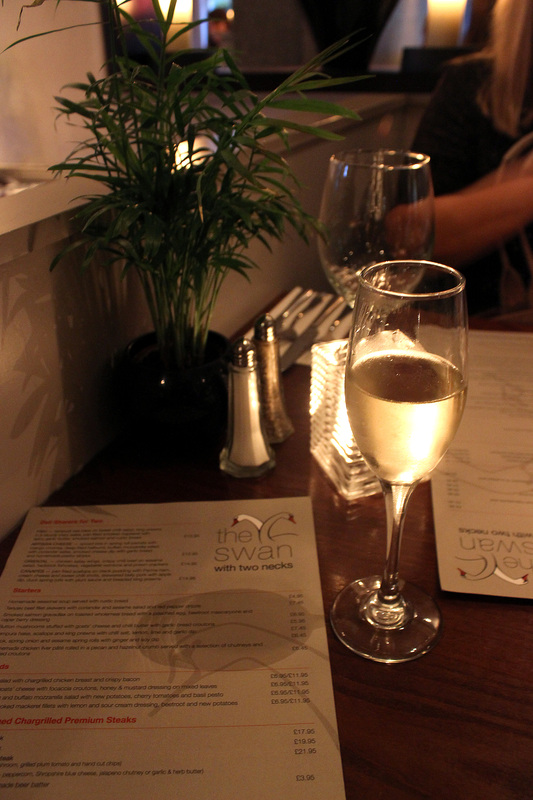 A few weeks back we visited The Swan With Two Necks in Newcastle Under Lyme with my parents for a birthday meal! We love The Wayfarer in Stone and after yet another great meal there for Joe’s birthday in April we decided to visit their sister pub The Swan With Two Necks after hearing great things. 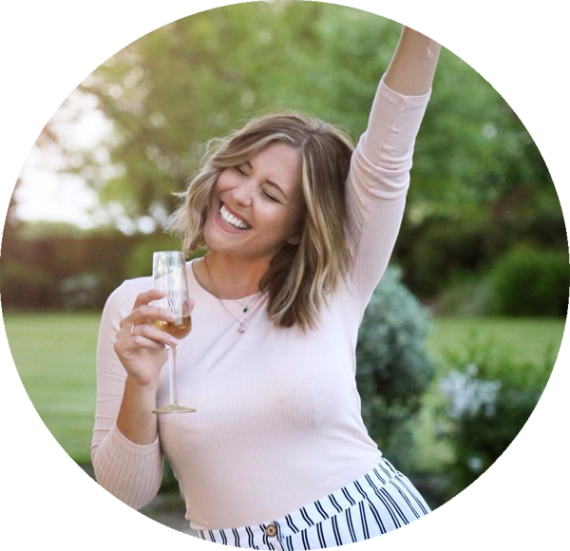 We booked in for 7:30pm on the Friday before my birthday ready to celebrate over some good food and of course a glass of fizz! Located pretty much in the middle of nowhere(!) 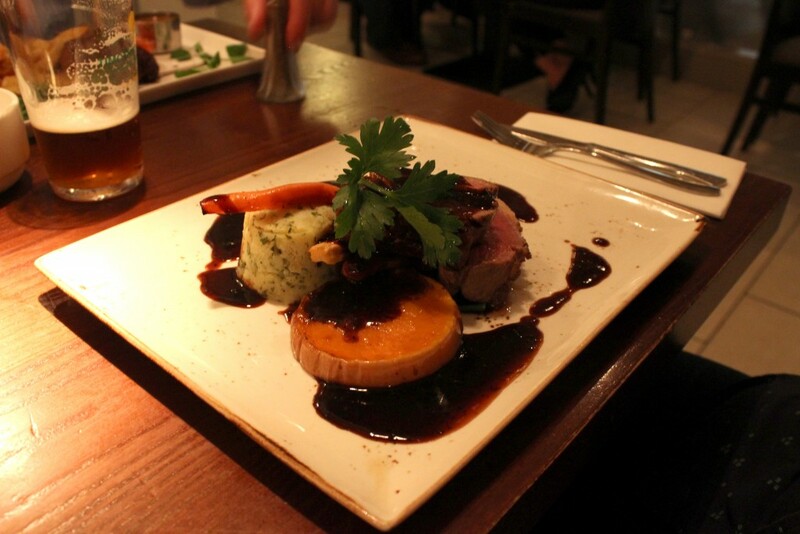 The Swan With Two Necks is a country pub with modern interiors and a fantastic atmosphere. With tables on different levels, seated sofa areas for drinks and chic decoration it’s my kind of pub and it’s clear why it’s so popular. We ordered a glass of fizz while waiting for our table (and opening birthday presents!) before we were lead through to eat. 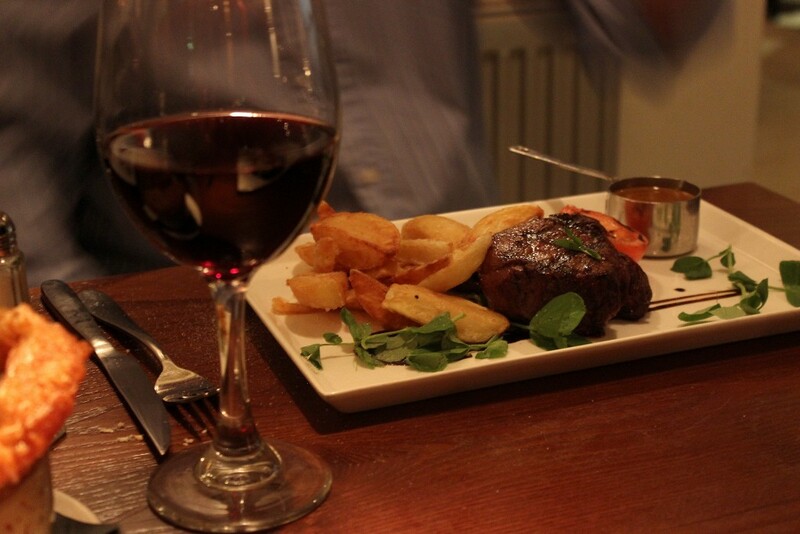 The menu is great, lots of choice with proper hearty pub food served with finesse. 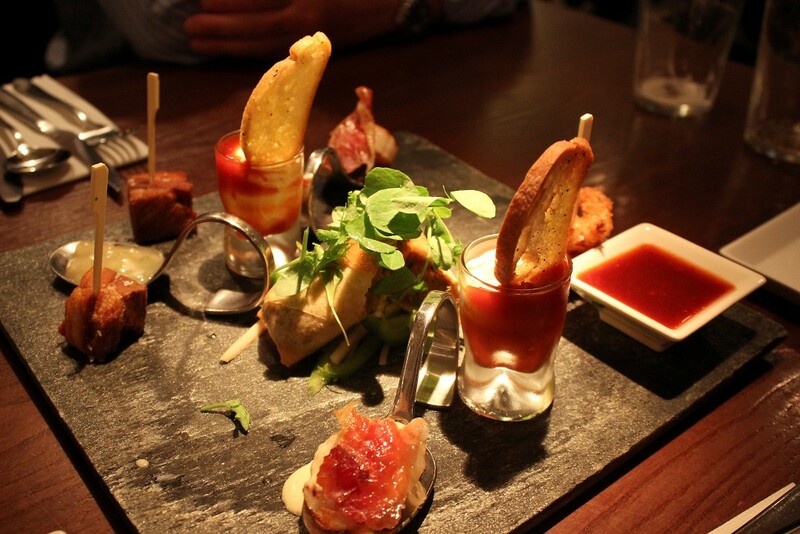 To start Joe and I couldn’t resist the Canape Sharing Board (£14.95) with pan fried scallops on black pudding with Parma ham, cream cheese and sweet chilli shots, skewered belly pork with apple dip, duck spring rolls with plum sauce and breaded king prawns! 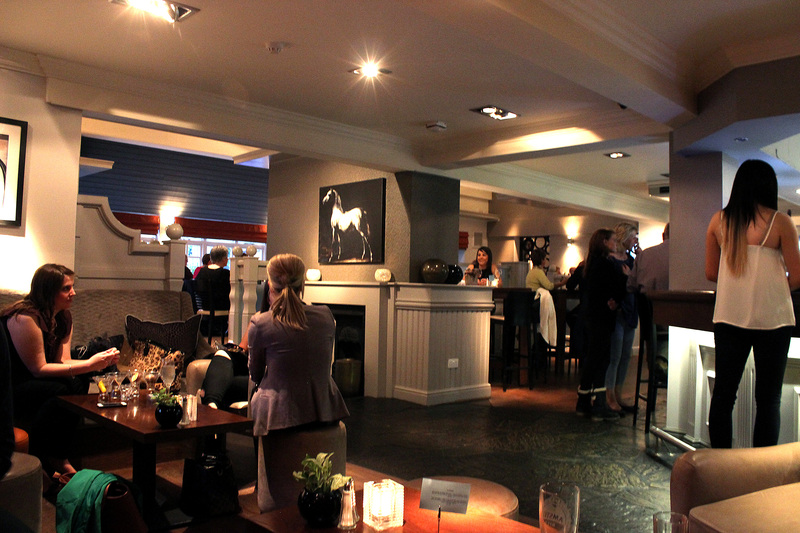 It was really tasty with a great selection of food – my favourite being the scallops and belly pork! 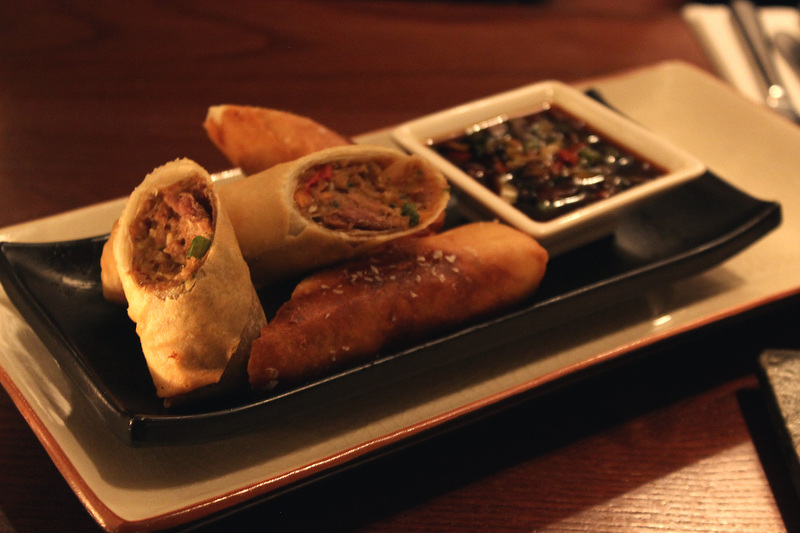 Mum went for the Duck, Spring Onion and Sesame Spring Rolls with Ginger and Soy Dip (£6.45) which were also really tasty – we had some on our sharing board too! I often find dishes like this a little strange in pubs but the Swan With Two Necks pulled it off really well and it made for a delicious starter indeed. 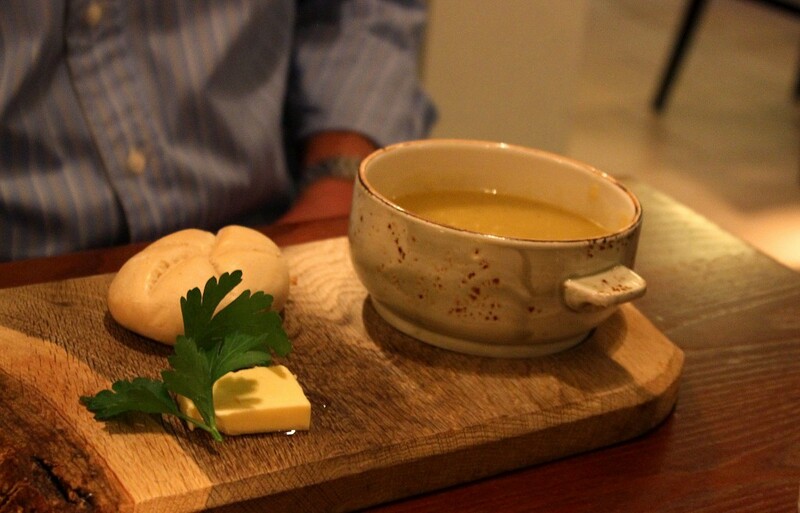 Dad went for Homemade Seasonal Soup – Parsnip – served with rustic bread (£4.95). A more traditional starter that was thick and creamy and smelt amazing – served on a wooden board with an adorable rustic bowl that mum wanted to take home for her kitchen! On to the mains! Joe ordered a hearty Pan Roasted Lamb Rump with Red Wine and Mint Sauce, Pan Fried Vegetables and Crushed New Potatoes (£16.95). I stole a bite of the meat and it was beautiful, Served pink and a real winner – i’d definitely order this the next time. 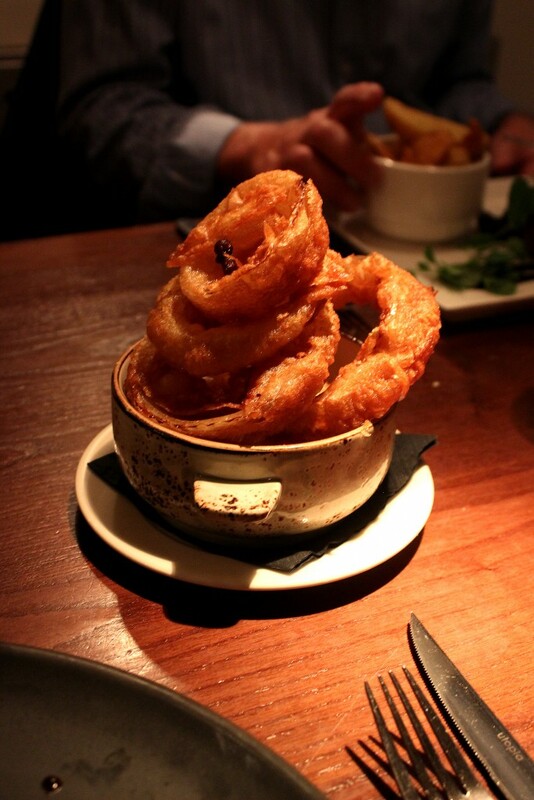 Mum and Dad are steak fiends so they both went for the 10oz Staffordshire Sirloin Steak (£19.95) and shared a portion of Beer Batter Onion Rings (£3.95). Served with chunky chips it was a good slab of meat and they were both cooked really well. Steak can always be a tricky one but i’d be confident ordering one from here again as there was nothing left on either of their plates at the end! 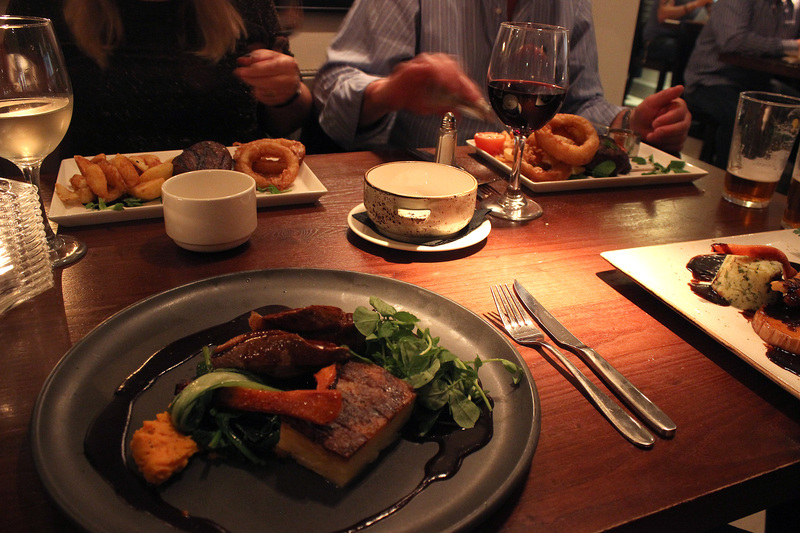 And last but no least, my choice – Pan fried duck breast with Dauphinoise Potatoes, Butternut Squash Purée, Roast Carrots and Cherry and Bourbon Reduction (£15.95). Again served pink it was a brilliant dish with the sweet Cherry and Bourbon Reduction and roasted veg. 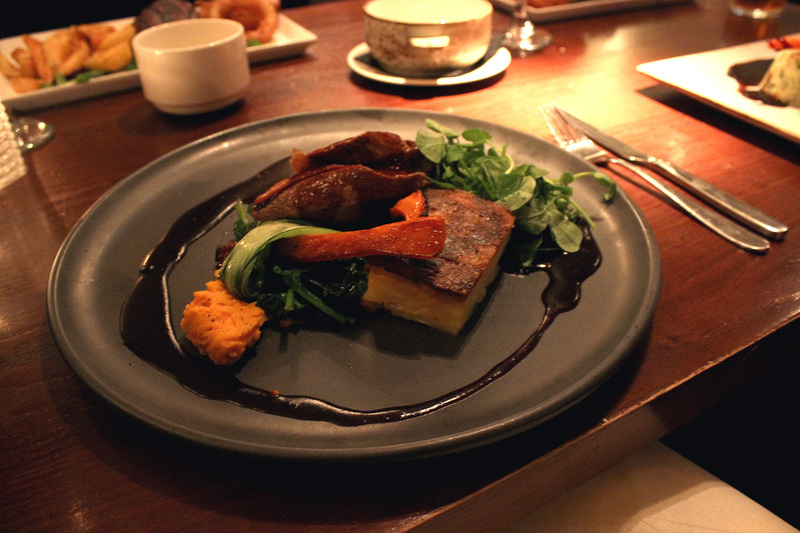 Just enough on the carb side with a reasonable potato portion and butternut squash puree it was well balanced and the flavours melded together wonderfully – I do love a good bit of duck! Little did I know that mum had snuck a birthday cake into the restaurant before we arrived so we had that for pudding (with a rousing rendition of Happy Birthday from the staff!) which meant no dessert menu for us. 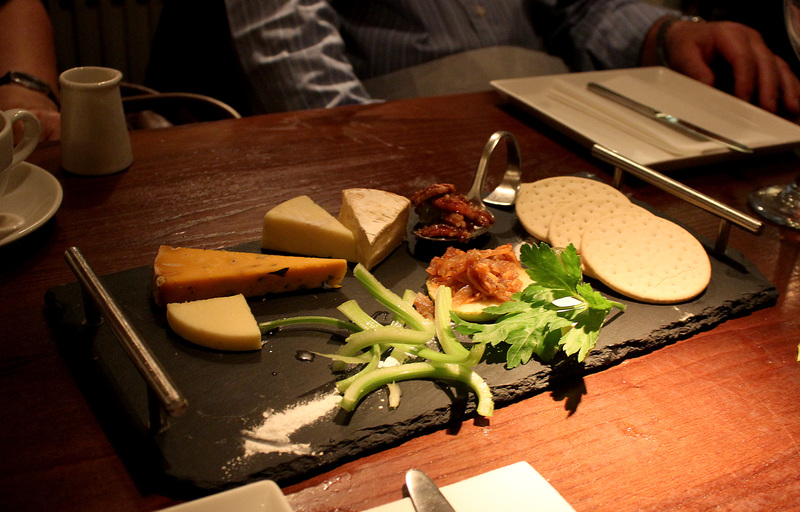 Dad and I did have a Cheese slate (£13.95 for two) however afterwards to finish off the meal with a glass of red wine and it was lovely. With Shropshire Blue, Ford Farm cave aged traditional Cheddar, Tunworth Camembert style cheese and wild garlic Yarg with artisan biscuits, caramelised apple, carrot and sultana chutney and grapes it was a great selection although I could have eaten that all to myself instead of sharing! As I was the birthday girl I didn’t see the bill at the end so i’m afraid i’m not sure how much it all came to, but as Dad didn’t keel over in his chair (even though quite a few glasses of wine, fizz and pints of beer were on there too) when he picked it up, I think we can safely assume it wasn’t a horrendous number! We thoroughly enjoyed our meal and would definitely come back. It’s a bit of a pain someone has to drive as it’s a little far out but they do have a large car park to accommodate their diners and the food alone will make want to visit again. 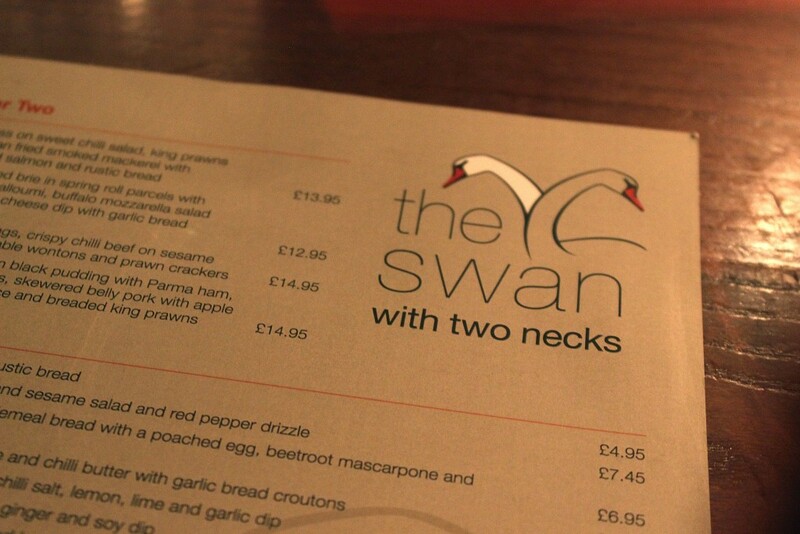 You can take a look at the full menu for The Swan With Two Necks and book a table on their website here. 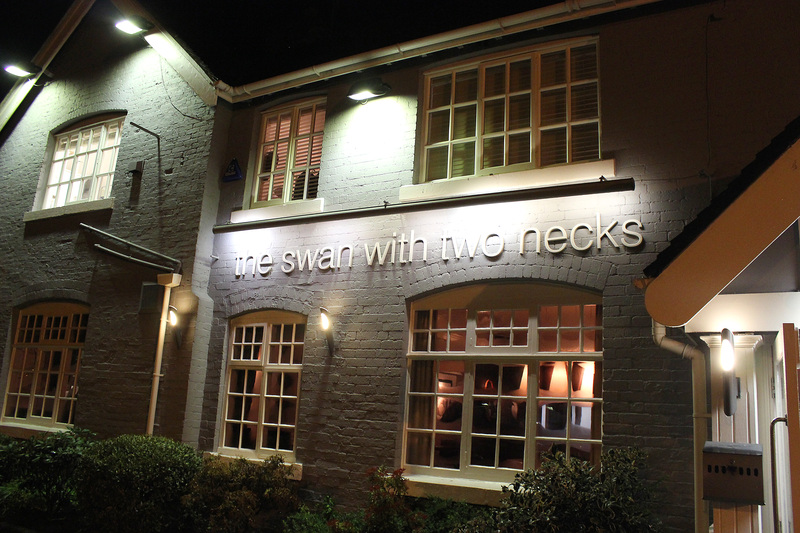 Have you been to the swan with two necks before? What did you order? Tweet me @xameliax or leave a comment below!